No we don’t mean the cars with the top speed rating, but those that spend the least time in or on dealer showrooms or lots – cars that seldom last much more than two weeks from arrival at the dealer until a new owner drives them away. There are the marketing success stories of the current models available, as reported by Joan Muller at Forbes, using data from Edmonds.com about which cars are the hardest to make a deal for in the US. First and foremost among these are the exhilarating new Scion FR-S and its Subaru soul mate, the BR-Z. Since its release last June, the FR-S has hit a chord with young urbanites and males with college degrees, who are grabbing these up like free lunch. “The demand has been terrific,” Toyota spokesman Greg Thome told Forbes, adding that they expects to sell about 11,000 this year – and they might sell even more if production were at a higher level. The supply is limited so the model is not easy to keep in stock, they roll out the door so fast. 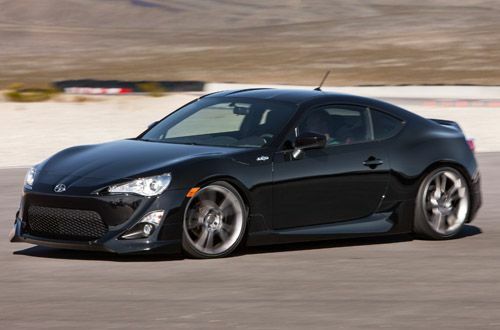 The Scion FR-S usually spends just 15 days at the dealer. The Subaru BR-Z is lasting only about 18 days in the showroom and neither brand has announced any intention to boost production, so the shortage will likely persist through next year. Another success story comes in the form of Ford’s C-Max hybrid, which normally only lasts 17 days on the dealer lot. The C-Max provides an attractive alternative to the Toyota Prius for many, and Ford has hit this one out of the park, surpassing the sales of the undeniable hybrid leader in two shorts months. Indeed, the C-Max is built on the same platform as the Ford Escape, thus providing a roomy versatile choice different from the Prius and yet with the high mileage rating many consumer are looking for today. It’s a big feather in the Ford bonnet that they have three vehicles that are among the fastest moving vehicles in America. One of those is not aimed at penny-pinching mileage misers, but a true tribute to the muscle car tradition in the US – namely the 650-hp Mustang Shelby GT500. With an all-aluminum, supercharged 5.8-liter V8 and at a top speed over 200 mph; The GT500 is selling well at $55K – an extra $7,000 for another 100 horses. Chances are you can’t buy a broken down thoroughbred for $700! The other Ford is the Fusion Hybrid that gets an EPA estimated 47 miles per gallon, is not easy to lay your hands on. However production of this model is just getting going but currently these mid-size hybrid sedans are only at the dealer for a scant 11 days. Granted, some of these cars move quickly because they are niche vehicles and not many of them are built, like the Mustang Shelby GT500, but this also applies to Mercedes-Benz big luxurious SUVs as well. The German automaker only sells 1,200 of the big G-Class utilities annually but once on arrives at a dealer, no moss grows on its north side in the short 14 days its on hand. Others are made en masse, but are such a value dealers can’t keep them in stock. The hamster-driven Kia Soul usually spends only 15 days at the dealer, for example. That’s despite the fact they sell 115,000 units a year. Another fast moving vehicle is the Hyundai Genesis that has boosted horsepower by 30 percent and has improved handling dynamics thanks to engines producing either 333 or 429 horsepower and 5-link suspension and a host of electronic traction, braking and stability systems. The expensive but exceedingly stimulating BMW M6 is in high demand after a two-year hiatus, consequently this ferocious example of the Ultimate Driving Machine never languishes more than 17 days on any dealer lot. Similarly the Mercedes M-Class, the brands mid-size luxury SUV, is another fast moving vehicle. Examples of the model usually never lollygag on lots more than 17 days. Americans love two things for sure and they are good deals and good products. All of these cars fit into one or both categories and if one’s in your future, get ready to fight for it – the competition is tough. You overlooked the Tesla Model S, an all American designed and built car that not only never sits on a lot but is sold out nearly a year in advance. You are correct but the Tesla is an anomalous form in that it has neither showrooms or lots where the vehicle languishes. Yes they have salons in certain places, but the true buying is done online. So including them wouldn't make sense as they are never in lots to begin with and they are not so hard to get it just takes a long time between the order and delivery. They cost a few bucks too.